Adequate sleep is absolutely essential to both good health and to the quality of one's life. As doctors and scientists have learned more about the nature of sleep and its importance to us, they have also discovered that a significant number of people suffer from disturbances of sleep, and that these disturbances affect how they feel, how they perform in their daily lives and how likely they are to suffer from other medical conditions. The doctors and staff at SleepCenterNYC work regularly with people suffering from a variety conditions that affect sleep. The full spectrum of sleep testing is done here at the Sleep Center, including those tests critical to the diagnosis and management of obstructive sleep apnea, narcolepsy, periodic limb movements and REM Sleep Behavior Disorder. What is more, once a diagnosis is made, we are able to provide you with access to all the most up-to-date, cutting-edge treatments for these conditions. Please use the resources presented here to learn more. Explore the tabs below for an introduction to sleep disorders and the various methods for diagnosis and treatment. In particular, feel free to check your "Sleep Score," found in the right-most tab. If you believe that you might suffer from a sleep disorder, be sure to discuss your symptoms with your doctor or with a certified sleep specialist. Coming to the Center for evaluation? Print, complete and bring our Sleep Questionnaire. While sleep can be disturbed in a multiplicity of ways (see "Web Resources" tab), the most important disorders are briefly described below. About 30% of adults and perhaps as many as 50% of people in some groups snore. There appears to be an increased susceptibility to snoring as one ages. Snoring can cause sleep deprivation to snorers and those around them, as well as daytime drowsiness and irritability. Multiple studies show correlation between loud snoring and an increased risk for both heart attack and stroke. Usually, snoring is recognized by a friend or partner who observes the patient sleeping. Besides the "noise" of snoring, the more worrisome condition known as sleep apnea can be associated with snoring. A sleep study can determine if significant sleep apnea is part of the picture. Obstructive sleep apnea, or OSA, is a very common sleep related breathing disorder that causes one to stop breathing during sleep. It occurs when tissues at the back of the mouth collapse and block the airway. keeping air from getting to the lungs. Obstruction occurs when the muscles inside the throat relax during sleep. Also, gravity can cause the tongue to fall back and block the airway, too, with blockages happening from a few times a night to several hundred times. OSA can occur in men and women of any age, but it is most common in obese, middle-aged men. As weight is gained, one's neck gets thicker, increasing the amount of fat in the back of the throat, making it more likely that the throat will become blocked with relaxation. There is a very strong correlation between OSA and neck size with people of neck circumference above 16 inches much more likely to be affected. Those with OSA also have a high incidence of high blood pressure, and have greater difficulty controlling their blood pressure with medications alone. Partners of those with OSA will report loud snoring, together with periods of silence when breathing ceases entirely. These episodes may be punctuated by noisy gasps for air as the sufferer awakens and struggles for breath. OSA is a serious disorder that must be treated. 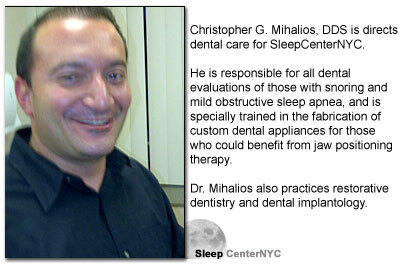 SleepCenterNYC specialists have expertise in this area. They will review your history and, where appropriate, arrange for an overnight sleep study to evaluate your problem. This can be performed in the certified Sleep Center facility. The results of this study will allow our doctors to generate an individual treatment plan for you. Narcolepsy is a chronic sleep disorder, ("dyssomnia"), characterized by excessive daytime sleepiness (EDS). Patients have extreme fatigue and may fall asleep at inappropriate times. Narcoleptics often experience disturbed night-time sleep often leading to confusion with insomnia. When a narcoleptic falls asleep he may enter the REM stage of sleep within a few minutes. Normal individuals do not do so until at least 90 minutes into sleep. Some narcoleptics also experience a problem known as "cataplexy," a sudden muscular weakness often brought on by strong emotion. These weaknesses range from a barely perceptible slackening of the facial muscles to total collapse. Narcolepsy is a neurological sleep disorder and is not caused by mental illness. Though often refreshed by short naps, narcoleptics find that after two or three hours, they feel sleepy again. Narcolepsy occurs in men and women with the same frequency, but does seem to run in families. It usually first presents between the ages of 12 and 20 years, but is not terribly commons, affecting about 1 in 2,000 people. There seems to be a correlation between narcolepsy and certain genes, although they are not required for the condition to occur. Certain genes are thought to increase the risk of an auto-immune response to cells in the brain that produce the protein hypocretin. This protein is responsible for controlling appetite and sleep patterns. Patients who become paralyzed while falling asleep virtually all have narcolepsy. Most others with symptoms that are consistent with the diagnosis will need sleep testing. This will usually involve and overnight sleep study (polysomnogram), together with a multiple sleep latency test (MSLT or "nap" test). In the MSLT, a person is given a chance to sleep every 2 hours during daytime. Observations are made of the time taken to reach various stages of sleep, measure the degree of daytime sleepiness and detect how soon REM sleep begins. Those with narcolepsy fall asleep quickly and enter REM sleep early. Periodic limb movement disorder (PLMD) was formerly known as nocturnal myoclonus. It is a sleep disorder causing the patient to move limbs involuntarily during sleep. PLMD should not be confused with restless leg syndrome (RLS), which occurs while awake as well as when asleep, and when awake, is voluntary. PLMD is involuntary, and the patient is usually unaware of the movements. For many with PLMD, limb movements are reported by a sleep partner. The disorder is diagnosed with a polysomnogram. Its expression may range from a small amount of movement in the ankles and toes, to wild flailing of the limbs. Although the exact cause of PLMD is unknown,many patients also suffer from Parkinson's disease or narcolepsy. It is increased among shift workers, those who snore, drink coffee, use hypnotics, or are withdrawing from sedative use. Rapid eye movement sleep behavior disorder (RBD) is a sleep disorder that involves abnormal behavior during the REM sleep phase. The abnormal feature of RBD is loss of muscle paralysis during REM sleep, the stage in which most dreaming occurs. Loss of motor inhibition leads to everything from simple limb twitches to complex movements in which patients unconsciously act out their dreams. The behaviors can sometimes be violent and may result in injury to the patient or bed partner. RBD can be confused with sleepwalking and sleep terrors. In those disorders, the sleeper is usually confused upon waking and does not become rapidly alert. In contrast, a person with RBD awakens quickly and easily and is able to recall clear details of the dream. A man with RBD dreaming of playing in a football game might dive from his bed to catch a pass. People with RBD rarely walk, have their eyes open, or leave the room, which are common signs of sleepwalking. Also, RBD episodes do not involve eating or drinking, sexual activity or going to the bathroom. RBD can be caused by adverse reactions to certain drugs or drug withdrawal, but is most often seen in the elderly and in those with neurodegenerative disorders such as Parkinson disease, and other neurodegenerative diseases. Home Sleep Test- In some situations the doctor may prescribe a home test. This involves the use of portable monitoring equipment that you can be instructed to manage at home. It may be used in instances where obstructive sleep apnea(OSA) is suspected but is not used to detect other sleep disorders. The doctor may decide that at overnight sleep study is a better option for you. If you have other medical problems, then an overnight sleep study could provide more accurate results. 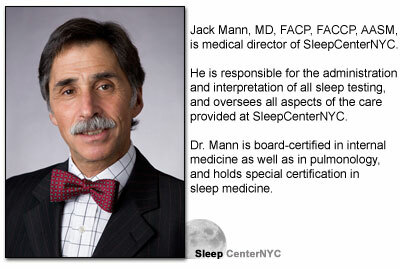 Overnight Sleep Test (Polysomnogram)- This test is performed at SleepCenterNYC facilities. It charts your brain waves, heart beat, and breathing as you sleep, and records eye and leg movements as well. Sensors are placed on your head, face, chest and legs and send signals to a computer that show when you are awake and asleep. Brain wave and eye movement monitors are used to evaluate the different stages of sleep, while breathing monitors tell the technician if you stop breathing and for how long. A clip placed on your finger (called a pulse oximeter) measures the amount of oxygen in your blood and can detect if this falls when you stop breathing. 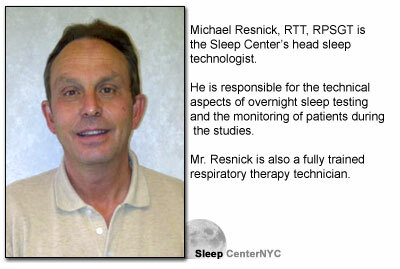 The doctors at the SleepCenterNYC will go out of their way to make you feel relaxed. You will be asked to come to the center in the evening and you will be allowed to make yourself at home in the bedroom. At the appropriate time, a technologist will place sensors on your skin and connect them to a computer. You will be allowed to read or watch TV until your normal bedtime. Once the lights are out, a low-light video camera allows a technologist to see you from a nearby room. He will need to detach the wires if you need to go to the bathroom during the night. Even though most people do not sleep as well as they do at home, this does not affect the results of the test. In the morning the sensors will be removed and you will be free to leave the Center. Treatments for sleep disorder vary greatly depending upon the nature of the condition diagnosed. Almost all snoring treatments for snoring involve clearing the blockage in the airway. Snorers are advised to lose weight, stop smoking and sleep on their side (to prevent the tongue from falling back and blocking the throat). Among the other treatment options sometimes proposed are nasal strips or nose clips, lubricating throat sprays, and "anti-snore"pillows. However, snoring should not be minimized and people who snore should seek professional medical advice before relying on treatments that merely mask the symptoms. Specially crafted dental appliances, which advance the lower jaw slightly and thereby pull the tongue forward, are a common treatment for snoring, (mandibular advancement splints). A dentist specializing in sleep apnea dentistry can provide an appliance that has been proven to be effective in reducing snoring and sleep apnea in mild cases. Although mandibular advancement splints are usually tolerated better than CPAP machines, possible side effects include gradual movement of the teeth, temporomandibular joint disorder and gum irritation. Surgery is a method of correcting social snoring. Some procedures, widen the airway by removing tissues in the back of the throat, including the uvula and pharynx (uvulopalatopharyngoplasty). These surgeries are quite invasive, however, and there are risks for complication. Radiofrequency ablation (RFA) is a relatively new surgical treatment for snoring. This treatment applies heat to the soft tissue of the soft palate and uvula that causes scarring of the tissue under the mucosa. With healing, this results in stiffening of the palate. While radiofrequency ablation can be effective in reducing the severity of snoring, it often does not completely eliminate it. The Pillar Procedure is a relatively new treatment for obstructive sleep apnea and snoring. Three small fibrous strips are inserted into the soft palate in a painless outpatient operation. The soft palate is rendered more rigid and snoring and apnea are reduced. Mild cases of sleep apnea may be successfully treated with lifestyle changes, including sleeping on one's side, and avoiding alcohol and sleeping pills. Dentists specializing in sleep disorders can prescribe and construct an custom-made oral appliance that shifts the lower jaw forward, opening up the airway. Oral Appliance Therapy (OAT) is usually successful in patients with mild to moderate obstructive sleep apnea. The use of OAT has led to increasing recognition of the importance of upper airway anatomy in the pathophysiology of OSA. For patients who do not tolerate these treatments, surgical treatment to alter the airway is possible. Several anatomic areas may be approached, including the nasal passage, throat, base of the tongue and facial skeleton. Since the obstructive region can be different from patient to patient, surgical treatment needs to be individualized. For many, correction of the nasal passages needs to be performed in conjunction with correction of the throat passage. Septoplasty and turbinate surgery may improve the nasal airway while tonsillectomy and uvulopalatopharyngoplasty ( UP3) is used to address pharyngeal obstruction. A variety of minimally invasive, out-patient procedures have been developed to attempt stiffening of the palate, preventing its collapse into the throat during sleep. While use of the laser to remove the uvula is no longer in favor, some report improvement when radio frequency radiation is delivered to the palatal tissues. Scarring that follows this procedure lends tightening to the palate, helping some with loud snoring and mild OSA. A more recently developed procedure, known as the "Pillar" procedure has generated interest in many circles. In this procedure, small implants are placed into the patients central palate by use of a needle introduction system. The scarring that follows in response to implant placement makes the palate stiffer and less likely to collapse into the throat. For those who fail all these operations, the facial skeletal may be advanced through two-jaw advancement surgery, (maxillomandibular advancement, or MMA). MMA is considered the most effective surgery for sleep apnea patients, and actually increases the size and patency of the airway. Treatment for narcolepsy is tailored to the individual, with he time required to achieve control of symptoms being quite variable. Adjustments in medications are frequently necessary, and complete control of symptoms is rarely possible. Medications are the mainstay of treatment, but changes to lifestyle are also helpful. Treatment of excessive daytime sleepiness is accomplished with central nervous system stimulant drugs such as methylphenidate,amphetamines, or newer agents, modafinil (Provigil) and armodafinil (Nuvigil).Among the non-stimulants used is atomoxetine (Strattera), a norepinephrine reuptake inhibitor (NRI).For many, planned regular short naps can reduce the need for medications. Cataplexy is frequently treated with tricyclic antidepressants such as clomipramine, imipramine, or protriptyline. Effexor XR (Wyeth Pharmaceuticals), an antidepressant which blocks the reuptake of serotonin and norepinephrine, has shown usefulness in managing symptoms of cataplexy, but has side-effects that include sleep disruption. The American Academy of Sleep Medicine (AASM) recently recognized the drug Xyrem as a standard of care for the treatment of cataplexy and daytime sleepiness. Xyrem is the only prescription specifically approved for cataplexy, and has been shown to reduce symptoms of EDS. While the exact mechanism of action is unknown, Xyrem may improve the quality of nocturnal slow wave (delta) sleep. Using stimulants to mask daytime sleepiness has real limitations. Lifestyle changes to reduce stress, more exercise and less coffee and nicotine are helpful in assisting treatment. Some with narcolepsy have a nocturnal body clock and are helped by doing work that allows for sleeping in the day and working at night. PLMD is often treated with anti-Parkinson's medications, including anticonvulsants, benzodiazepines, and narcotics. Patients must stay on these medications in order to experience relief for there is no known cure for PLMD. Patients are also advised to not consume caffeine, alcohol or antidepressants. Other medications for reducing or eliminating the leg jerks include dopaminergic drugs such as pramipexole and ropinirole. Other dopaminergic agents such as co-careldopa, co-beneldopa, pergolide, or lisuride may also be used. These drugs decrease both leg jerks and arousals and are also successful in the treatment of restless legs syndrome. Clonazepam, a benzodiazepine, has also been shown to improve objective and subjective measures of sleep. RBD is treatable, with medications prescribed based upon the varying symptoms. Low-dose use of clonazepam has a 90% success rate, although how it works to restore REM atonia is not known. It is thought to perhaps suppress muscle activity, rather than directly restoring atonia. Melatonin can also be prescribed as a more natural alternative to clonazepam. For those with Parkinson's and RBD, Levodopa is a popular treatment option. In addition to the use of medication it is wise to alter the sleeping environment in case episodes should still occur.. Removing dangerous objects from the bedroom and placing cushions around the bed may help protect against injuries. Explore information on other sleep-related topics with these links from the American Academy of Sleep Medicine. Symptoms are often reported not by the patient, but by his or her bed partner. If you or someone you know has any of these symptoms regularly, you should seek the opinion of your family doctor or healthcare provider. An overnight sleep study (polysomnogram) may be warranted. For most sleep disorders, a polysomnogram is required to make an accurate diagnosis. This is the standard series of questions that are widely used to see if the quality of your sleep affects your daily life. Please rate how likely you are to fall asleep in the situations listed. Unter the number of your answer into each of the fields. Once done, click "Calculate Score." "Sleep medicine is a medical specialty or subspecialty devoted to the diagnosis and therapy of sleep disturbances and disorders. Pulmonologists are particularly equipped to deal with sleep issues, building upon their pre-existing knowledge of sleep related breathing problems."